Don't miss our 2019 swimsuit collection !! 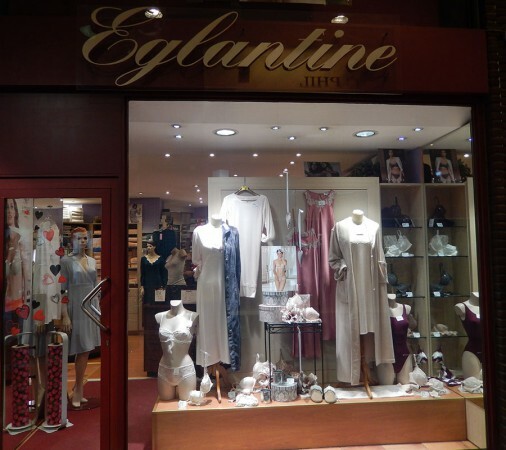 Founded in 1980, our boutique Eglantine Lingerie is located in the Brussels Cinquantenaire district close to the Merode Metro Station. We offer the finest range of quality intimate apparel. Our highly-qualified professional team will be happy to help you find just what you are looking for in lingerie, corsetry, nightwear, swimwear and beachwear. You can choose from a broad and stylish collection of comfortable, glamorous, sportive feminine products which will flatter your figure, enhancing your silhouette and the appearance of your clothes. From the wire-free cotton bra to the girdle that trims your waist, from the comfortable nightie to classic silk pyjamas, lingerie sets, swimwear and beachwear, we have a treasure trove of attractive items in stock. Ask our experienced professional staff for advice. They will help you to choose from our wide collection of best brands, items that will fit any budget and any body type. We shall be happy to welcome you in person in our charming family boutique. Our illustrations will give some idea of the treats in store for you. If you cannot come in person, we shall be glad to receive your orders by Email, and we will give them our most careful professional attention. Our personnel are familiar with British, American and Continental European sizes. Why not enjoy a preview by browsing through the rest of our website ?